Active Networks is an online activity and event management solution that enables organizations to fully leverage powerful cloud technologies to plan, organize, and implement successful events and activities as well as manage their memberships and grow their communities. The platform is hugely popular among race organizers and offers specific packages for specific events. For businesses, Active Networks is an ideal solution for managing membership subscriptions, reservations, facilities, check-ins, and more. Widely used by parks and recreations, ski resorts, outdoor adventure companies, and more, Active Networks also caters to academic institutions, camps, and charitable organizations. Over 42,000 organizations use Active Networks to help them manage their events as well as handle the business side of event organizing. 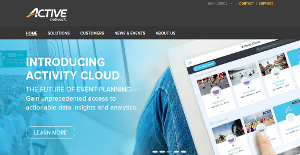 With Active Networks, users find it very easy to plan, organize, and execute events. The registration module simplifies many processes, including automation of sign-ups, payment collection, and keeping track of the number of members or participants among others. Active Networks allows users to configure their payment methods, like letting participants choose to pay via credit card online or send a paper check. Organizers can also offer payment installments – paying a reservation fee up front and then paying the remaining balance on site. Active Networks offer a number of specific packages based on common activities people look for. For instance, Active Networks offers a Race Package that comes with all the automation tools, registration tools, and other technologies and features to help organize and execute a race event. Aside from registration tools, the race management software provides marketing tools to help you attract more participants and out your brand forward. Other packages offered by Active Networks include Recreation, Outdoor, Camp Management, Sports Management, and Skis and Attractions among others. Active Networks allow organizers to create discount codes and coupons for special types of participants or to encourage them to make immediate payments or invite their friends and loved ones to join. For events that require doctor’s approval, such as camps for kids, or official sporting events that need legal documentation, Active Networks constantly update their software to help participants and organizations comply with prevailing policies and laws. If you are considering Active Network it might also be a good idea to analyze other subcategories of Best Event Management Software collected in our base of SaaS software reviews. Each enterprise has different wants and requires an application that can be personalized for their size, kind of workers and buyers, and the specific industry they are in. For these reasons, no system can proffer perfect tools off-the-shelf. When you search a software app, first be sure what you need it for. Read some Active Network reviews and ask yourself do you want basic functionality or do you require complex tools? Are there any industry-specific functionalities that you are searching for? Obtain the answers to these questions to aid your search. There are multiple factors that you need to reflect on and these include your finances, specific business needs, your organization size, integration requirements etc. Take your time, check out a few free trials, and finally choose the system that provides all that you want to enhance your firm efficiency and productivity. How Much Does Active Network Cost? We realize that when you make a decision to buy Event Management Software it’s important not only to see how experts evaluate it in their reviews, but also to find out if the real people and companies that buy it are actually satisfied with the product. That’s why we’ve created our behavior-based Customer Satisfaction Algorithm™ that gathers customer reviews, comments and Active Network reviews across a wide range of social media sites. The data is then presented in an easy to digest form showing how many people had positive and negative experience with Active Network. With that information at hand you should be equipped to make an informed buying decision that you won’t regret. What are Active Network pricing details? What integrations are available for Active Network?